Sleeping Bear Press has a special Discover the World book series to help young children (and us older children) learn more about the world around them. I've reviewed a few of these titles in the past, but there are some new releases worthy of some consideration. 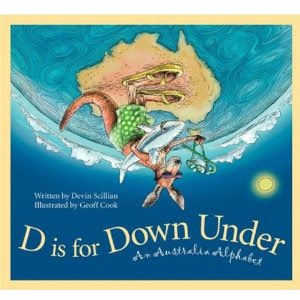 First, travel south to the land down under with D is for Down Under: An Australia Alphabet . This one was interesting for us to read on the tales of having introduced Bookworm1 to the Disney film The Rescuers Down Under. After watching that movie with me, this book became a little more curious, beginning with the letter G which stands for the Great Barrier Reef, of course! But you can explore more of Australia from A to Z. Definitely scored a point with me for making 'D' stand for didgeridoo. I had a friend when I was growing up who liked to stand out in weird ways and so he made a didgeridoo. Of course, it wasn't authentic but I think he just liked saying the word "didgeridoo" . . . and besides, no one else had one. Travel just a little further north with D is for Dala Horse: A Nordic Countries Alphabet . I should point out that the first page of each of these books contains a map so that you can easily find these countries on a globe. 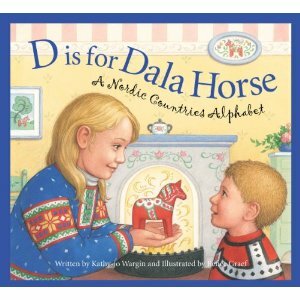 In D is for Dala Horse we find our map focused on the Nordic Countries, highlighting them so that the reader can easily identify the places and cultures which this particular title explores. From A is for Arctic Fox to Z is for the Zig Zag roads "through mountains, coasts, and more" this book really makes me crave a nice cup of hot chocolate and a few Jan Brett winter-themed books! It even includes T is for Tomtens or a Troll which is lots of fun. This book is beautifully illustrated by Renee Graf who did a wonderful job creating a colorful world out of one that I typically view as being ice cold and very, very white! 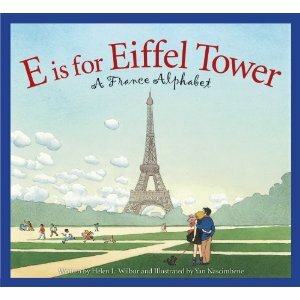 Lastly, for the romantics out there we have E is for Eiffel Tower: A France Alphabet. We open with our map, of course, and situate where France is in Europe. Then we travel in, visiting Amphitheaters, the Chartres Cathedral, and Utah Beach. Of course, we meet up with the likes of Victor Hugo, Napoleon Bonaparte, and the lovely Mona Lisa. At the back of this book there is a list of "good-to-know" phrases along with phonetic spellings so you can learn how to say things like, "It's nice to meet you" and "How much does this cost?" This is a cute, fun book and a nice addition to the line-up. These sound like wonderful books! They're definitely going on my "To Buy" list--maybe as Christmas gifts. Love, love, love Sleeping Bear Press!! We're planning a road trip to the Chattanooga area, I wonder if they have any books for that city? ;) The Texas cousins might need a Texas book for Christmas as well.